Staying healthy or creating healthy habits are some of the most popular goals people set. Making changes to our lifestyles can sometimes be a little tricky, and almost always require some effort on our parts. Having a way to track our progress and hold ourselves accountable for making those changes and staying on track with them is crucial for many of us. That is just one of the reasons why I’m so excited to be sharing this month’s Reader Request! I love doing these features because often times I end up creating a printable (or more) that I wouldn’t have thought to make for myself. This month is a great example of that. 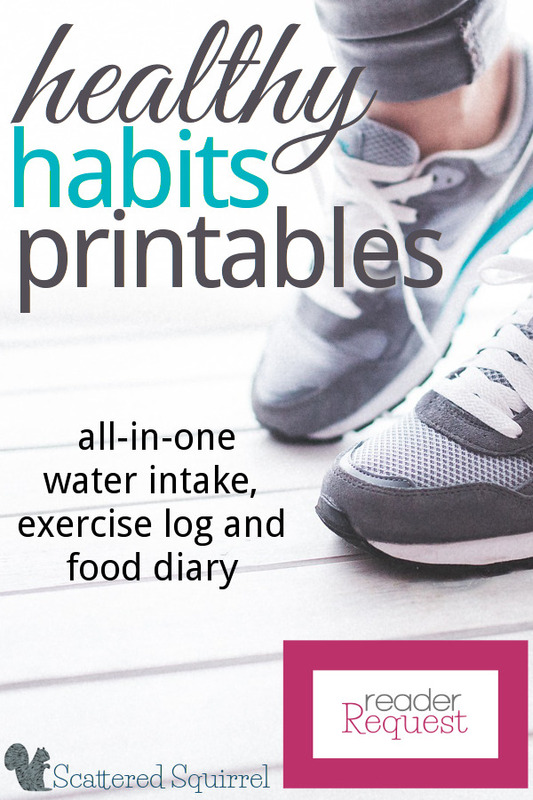 Personally speaking, I try to make sure I’m fitting in exercise each day and drinking enough water, and I’ll make notes or add reminders into my planner. Having a separate space to keep track of this just never occurred to me. 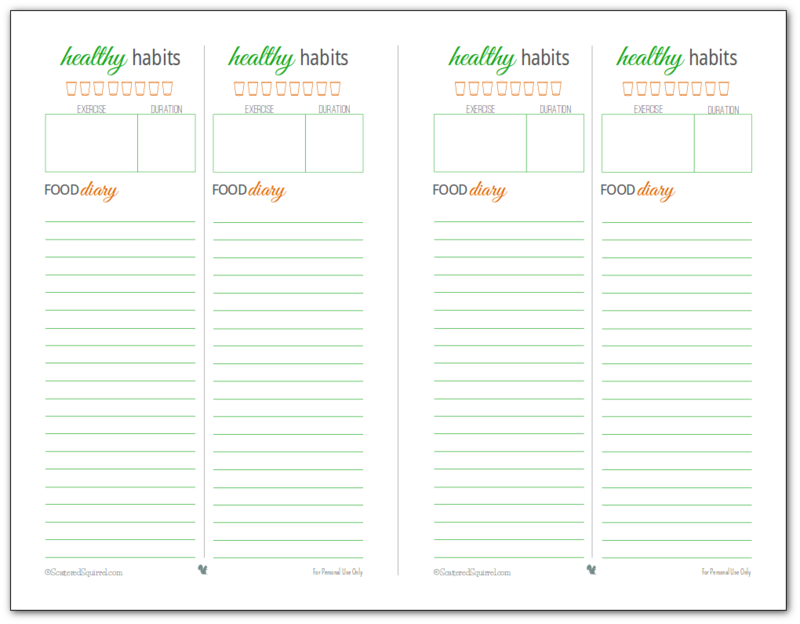 For many of you though, it’s something you’ve been asking for, and I’m happy to say that these healthy habits trackers are ready for you download and print! So, that’s what I opted to work with. 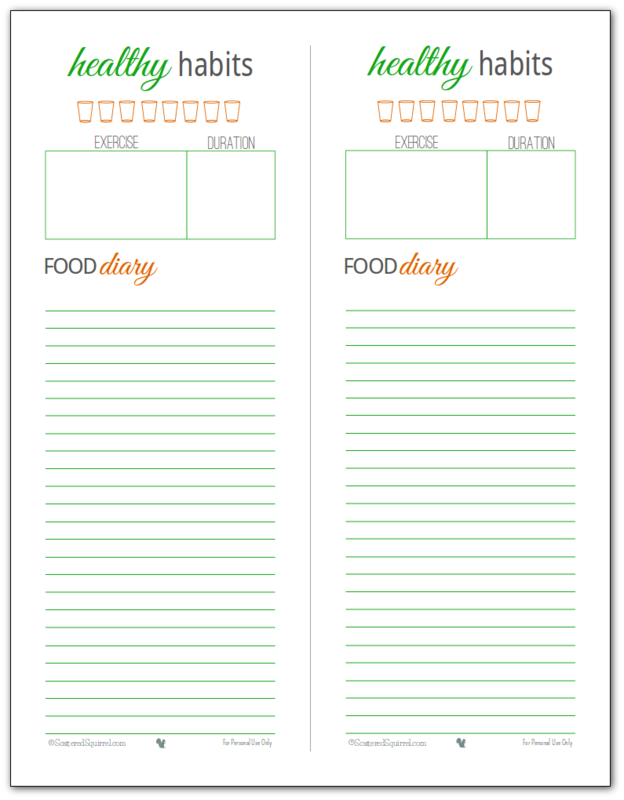 I made sure to leave plenty of room in the food diary section for those who would also like to make notes or record other things. Hopefully you will find these fit the bill for what you are looking for. tuck them into your planner. As a bonus, they act as a book mark for the current week. I plan to remove the full ones and store them in a folder on my desk so I have them to track my progress. I also made them in a half-size version, because I know many of you prefer these over the full size ones. You can use these in the same way mentioned above, you just need to take two more steps. make sure to stack them so that the larger side margins are all on the same side. I have to admit, the more I worked on these, the more I could see the benefit to having a tool like this to help stay on track while building and maintaining healthy habits. Being able to see at a glance how I’m doing each day or week has been great so far. I wasn’t sure about the food diary part because I’m not a calorie counter, however I’ve been finding it rather enlightening to see just what I’m eating each day. It takes no time at all to jot it down. If I’m at home for the whole day, I pop that day’s healthy habits tracker on the fridge so that it is super easy to make a note of what I’m grabbing for a snack, meal, or drink. I hope you find these to be helpful too! As always, to grab a copy of these printables for yourself, simply click the pictures. And don’t forget, if you’d like them customized to suit your tastes or needs better you can hop on over to the Customized Printables page and send in an order. Do you have health goals? 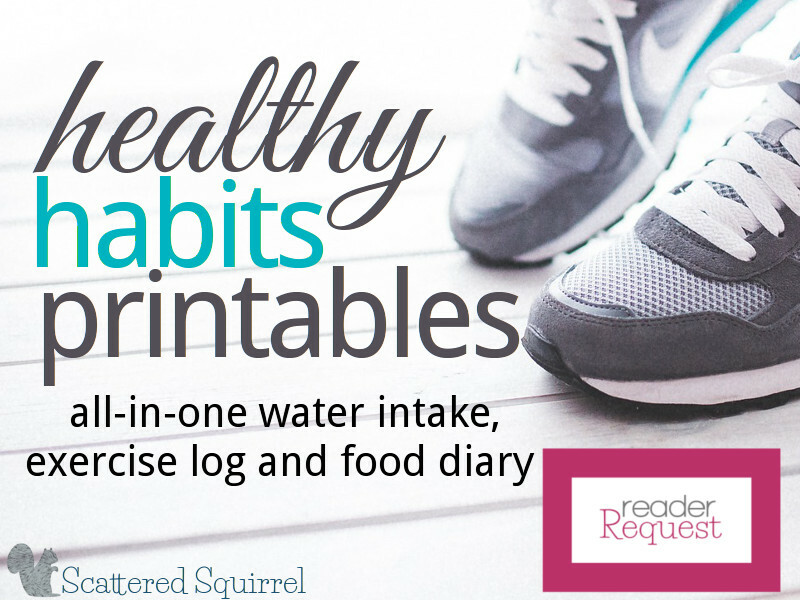 Will these healthy habits printables be a help to you? These are fantastic! Plus, if you’re already plannering, having somewhere to keep all of this information just makes sense! And if someone is not plannering, I would ask them why not, ha. Thanks Havok. It wasn’t something I would have thought of creating, but I’m suprised at how quickly it’s become a part of my planner system and daily routine. Me too, Lisa. I was suprised at how easy it was to incorporate these into my daily schedule. I’m happy you like them. I hope they work for you Sandy.